The Student Conflict Report will show you the dancers who have less than or equal to the number of dances in between their numbers. It will show your quick changes! Select the Recital you want to check. Then chose the number of dances that you want to see dancers have equal or less between their specific performances. For example if you want to see all dancers who have 2 or less numbers in between their specific numbers, chose the number 2. The report will list each dancer and the names of the dance that have conflicts. The first column has the show name with a hyperlink. If you click it, it will bring you to the dance order so you can re-position the dance order. 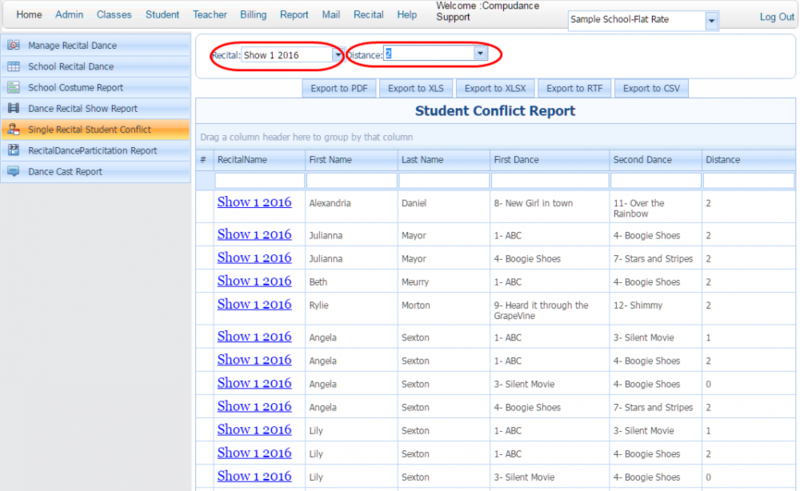 Once the order is changed, you will want to run this report again in case you made other conflicts for different students. This report can also begrouped to help you see the conflicts in different ways. If a student is in more than 2 dances, they may be listed more than once on this report. For example if the student is in dance number 2, 4, 5 and 8. If you search for 2 or less dances in between.